1.1. This Terms of Service Agreement (“Agreement”) is an agreement between you (“you” or “user”) on the one hand, and Golden Nugget Atlantic City, LLC (“GN”) and Rush Street Interactive NJ LLC (“RSI”) (collectively “Company”, “we”, or “us”) on the other hand. 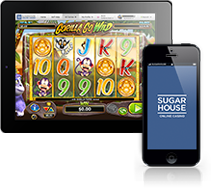 This Agreement governs our operation and offering of, and your access to and use of, the SugarHouse® online casino, whether accessed via computer or mobile device at www.playsugarhouse.com, or via a mobile application or any other technology (collectively, the “Services”). 1.2. GN is authorized to provide the Services in the State of New Jersey under Internet Gaming Permit NJIGP# 15-002 issued by the New Jersey Division of Gaming Enforcement (“DGE”), and pursuant to and in accordance with the New Jersey Casino Control Act, N.J.S.A. 5:12-1 et seq. (the “Act”), and the regulations promulgated thereunder, N.J.A.C. 13:69-1 et seq. (the “Regulations”). GN has contracted RSI to operate the Services, and the DGE has assigned Vendor Identification No. 86573 to RSI. By entering into this Agreement, you acknowledge that RSI may exercise any of GN’s rights and fulfill any of GN’s obligations under this Agreement. 1.3. BY CHECKING OR CLICKING THE “I ACCEPT THESE TERMS” BOX OR BUTTON OR USING THE SERVICES, YOU CONFIRM THAT YOU HAVE READ THIS AGREEMENT AND AGREE TO BE BOUND BY ITS TERMS. IF YOU DO NOT AGREE WITH ANY OF THE TERMS OF THIS AGREEMENT, YOU MUST NOT CHECK OR CLICK THE “I ACCEPT THESE TERMS” BOX OR BUTTON, AND YOU ARE NOT PERMITTED TO USE THE SERVICES. 1.4. We may, in our sole discretion, modify this Agreement with or without notice to you. The “Last Updated” date at the top of this Agreement will indicate when the latest modifications were made. By continuing to use the Services after this Agreement has been modified, you are agreeing to such modifications. Therefore, you should review this Agreement prior to each use of the Services. You can obtain a copy of these Terms and our Player Protection policy at any time by emailing our Player Support services team at [email protected]. 2.1. It is a criminal offense for anyone under the age of twenty-one (21) (the “Legal Age”) to participate in wagering games online, and no one under the Legal Age is permitted to use the Services. We reserve the right in our sole discretion to request proof of age or re-confirm such information from you at any time. We may terminate your account and prohibit you from using the Services if proof of age is not provided or if we suspect that you are not at least the Legal Age. 2.2. There are Federal prohibitions and restrictions regarding Internet gaming, specifically, the limitations upon Internet gaming set forth in 18 U.S.C. §§ 1084 et seq. (The Wire Act) and 31 U.S.C. §§ 3163 through 3167 (UIEGA). It is a Federal offense and a violation of New Jersey state law (N.J.S.A. 5:12-95.23a) for persons physically located outside of the State of New Jersey to engage in internet wagering through a casino in the State of New Jersey. In order to participate in wagering games offered through the Services, you must be physically located in the State of New Jersey. You agree that you will not attempt to participate in such wagering activities while physically located outside of the State of New Jersey, and acknowledge that any such attempt could result in enforcement actions against you. We, our third-party service providers, and the DGE will utilize tracking technologies to verify and record your physical location when you are participating or attempting to participate in wagering games through the Services ("Geolocation Technologies"). These Geolocation Technologies will report the physical location of the device you are using to access the wagering games through our Services to us. By registering for an account through the Service and/or by using the Services, you consent to the above-described uses of Geolocation Technologies, and to storage of records confirming your location within the State of New Jersey for up to ten (10) years as required by the Act and Regulations. Certain features of the Services, including play-for-fun versions of the wagering games, will be available to you for use outside of the State of New Jersey, but other features (such as chat functionality associated with certain games) may be unavailable. Please contact us if you have any questions about the availability of any particular features. 2.3. Individuals who (i) are employed by casinos in the State of New Jersey or by other companies holding casino licenses in the State of New Jersey, and additionally (ii) who hold a “key employee” license with the DGE, are prohibited from wagering in any casino or simulcasting facility in the State of New Jersey, and as such, are not permitted to access or use the Services. Additionally, employees and household members of Company and its third-party service providers, and their respective affiliated entities, are prohibited from participating in wagering games and Promotions offered through the Services. 2.4. You understand and agree that we are unable to provide you with any legal advice or assurances, and we make no representation or warranty, in respect of the legality of your use of the Services. You are solely responsible for confirming that your registration with, and use and continued use of, the Services complies with all laws that apply to you. You represent, warrant, and agree to ensure that your use of the Services will comply with all applicable laws and regulations. Please consult your own legal counsel if you have any questions about the legality of your use of the Services. 3.1. You may set responsible gaming limits for the Services, including deposit limits, spend limits, and time limits, and/or self-suspend your participation in wagering games offered through the Services for a designated time period of at least 72 hours (a “Cool-Off Period”) as detailed at: https://www.playsugarhouse.com/?page=my-account&subpage=responsible-gaming#resplimit-cooldown. 3.2 You also have the right to participate in the New Jersey Casino Self-Exclusion Program and be placed on a self-exclusion list maintained by the DGE (“Self-Exclusion List”). By opting to place yourself on the Self-Exclusion List (for, as you elect, 1 year or 5 years), you are prohibited from using the Services and otherwise engaging in internet gambling anywhere else in the State of New Jersey. We will also not be allowed to send you any marketing communications with respect to the Services while you remain on the Self-Exclusion List. You will not be permitted to engage in internet gambling in the State of New Jersey until after your specific exclusion period ends and you have requested removal from the Self-Exclusion List by visiting any office of the DGE during business hours. Self-Exclusion List elections are irreversible and cannot be ended early. Additional information on the Self-Exclusion List is available at: http://www.nj.gov/oag/ge/selfexclusion.html. 3.3 If you or someone you know has a gambling problem, and wants help, call: (a) the Council on Compulsive Gambling of New Jersey at 1-800-Gambler (see also: www.800gambler.org); or (b) Gamblers Anonymous at 855-2-Call GA (see also: www.gamblersanonymous.org). We strictly abide by anti-money laundering rules and regulations which require us to report you to authorities if we suspect or know that any of your transactions through the Services (i) involve funds derived from illegal activities, (ii) are intended to conceal funds from illegal activities, or (iii) involve the use of our Services to facilitate criminal activity. We will keep a secure online list of all registered players, and we will report any suspicious behavior to the relevant law enforcement and regulatory authorities. 5.1. In order to participate in wagering games and Promotions offered through the Services, you are required to become a registered account holder. You may apply and register for only one account for the Services, and you must register using your own legal name. You may never access or use the Services through another person’s account or permit any other person to access or use the Services using your account. You also may not sell, transfer, purchase, lease, license, lend, or share your account or the account of any other person. 5.2. When you apply for an account, we will ask you to provide your personal information including, as we may require in our sole discretion, your name, e-mail address, physical address, date of birth, gender, driver’s license (or other government-issued ID) information, and/or social security number. We may also give you the option to provide your Rush Rewards and SugarHouse® Casino4Fun™ (or similar Company loyalty program) account numbers, if any, to accelerate your registration to the Services. When you wish to fund your account to participate in wagering games offered through the Services, we will also ask you for financial account/deposit and withdrawal method details. You represent and warrant that all information that you provide to us at any time, whether during the account application process, in connection with funding your account, in response to any security check or age / location verification, as well as in any information posted through the Services (e.g., in chat rooms, your profile pages), or otherwise in connection with your account, is complete, accurate, and not misleading. You further agree to inform us immediately if there is any change to such information. 5.3. At any time during the registration process or thereafter, we may also ask you to provide supporting documents including, but not limited to, (a) a copy of your driver’s license (or other government-issued ID), (b) proof of your address such as a utility bill or bank statement, and (c) proof of your financial account/deposit and withdrawal method. In our sole discretion, we may ask that you provide notarized copies of these documents as an additional layer of verification. You hereby expressly consent to our verification (including through third-party verification services) of all information you provide during the account registration process or thereafter during your use of the Services. 5.4. In addition to the above-specified verification processes, you also hereby expressly consent to our performance (directly or through our third-party service providers) of background checks on you in order to verify your identity, history, or any other information you have provided to us. These background checks may vary on a case-to-case basis, but could include credit checks and/or general background investigations. We are not obligated to advise you when we perform a background check or the nature of any particular investigation. 5.5. Upon our verification of all your application information, we will issue you an account for participation in wagering games and Promotions through the Services. In the event you do not complete any request for information or documents, or we are not satisfied for any reason, in our sole discretion, with any information provided, we may refuse to grant you an account, or we may suspend or terminate your existing account. In such an event, we will only refund deposits you have made in your account (unless otherwise prohibited by the Act or Regulations); we will not be obligated to refund any Bonus Money (as defined in Section 9.2) or winnings (whether or not resulting from wagers of Bonus Money or unrestricted funds on-deposit in an account). 5.6. We further reserve the general right at any time, and in our sole discretion, to suspend or close your account without further explanation if we consider it necessary to do so for any reason. In the event that we terminate your account under this provision without regard to a breach of these Terms by you, we will refund the unrestricted (i.e. withdrawable) cash balance of your account to you, but not any Bonus Money in your Bonus Bank (as defined in Section 9.3) then-remaining unconverted to cash. All decisions by us with respect to your account or your use of the Services are final and not open to dispute or appeal. 6.1. When opening an account with us, you must choose your own unique screen name, and password. You assume responsibility for ensuring that neither your screen name nor your password constitute your real name (or any part thereof) or disclose any personal information about you. We reserve the right to change your screen name at any time and for any reason in our sole discretion, and we will notify you of any change made via email. 6.2. Your email address or screen name will be your username for the Services. You will use your username and password each time you login to the Services. Please select a strong, unique password, which is less likely to be guessed or discovered by others. You are solely responsible for ensuring that your username and password are kept secure and confidential at all times, and that you protect their secrecy and confidentiality. You are responsible for all usage and activity on your account, including but not limited to all financial transactions such as deposits and wagers made using these login details and/or your account, and all postings and comments through the Services, including by any person who uses your registration information, with or without authorization, or who has access to any computer or device on which your account resides or is accessible. Any unauthorized use of your login details shall be your sole responsibility and will be deemed as your activity. If you lose or forget your username and/or password, or if you are concerned that a third party is aware of them, please contact us immediately. If you have reason to believe that your account is no longer secure (for example, in the event of a loss, theft or unauthorized disclosure or use of your username and/or password), you must promptly change the affected registration information by using the update mechanism available through the Services. We will not be liable to you for any loss that you may incur as a result of an unauthorized person accessing your account, and we accept no liability resulting from its unauthorized use, whether fraudulent or otherwise. 6.3. You can elect, at your option, for “strong authentication” of your account during the account registration process. With strong authentication, each time you wish to log in to your account, you will receive an email message from us containing a temporary PIN number. You must then enter that PIN during account login in order to access your account. 6.4. In the event that you forget your password, or that your password becomes, or you suspect that it may become, known to any unauthorized person, you will immediately notify us of such event. You may reset your password at any time by clicking on any “lost password” link available through the Services, after which, we will send a password reset link to your email address on file. By clicking on that password reset link, and by correctly answering two security questions we have on file for you, you will be able to select a new password. We will confirm each successful password reset via email to your email address on file. 6.5. After three consecutive incorrect account login attempts, your account will require secondary authentication (via password and a PIN we will send to your email address on file) for login. After ten consecutive incorrect login attempts, our system will lock your account and make it inaccessible for 15 minutes, whether or not the correct password is provided during such period. However, you may bypass the lockdown period by resetting your password as specified in Section 6.4. 7.1. In order to wager on games through the Services, you must open an account and have adequate funds deposited and cleared. The minimum account deposit is displayed in the Deposits page. Only wagers placed from your account will be valid, and any winnings resulting from such wagers will be credited to your account. You can make all deposits and withdrawals by accessing the Deposits page of your account through the Services. You can also make deposits and withdrawals at any cashier cage located at the Golden Nugget Casino located at Brigantine Blvd & Huron Ave, Atlantic City, NJ 08401, or at participating 7-11® stores in the State of New Jersey via the PayNearMe® payment service. 7.2. To deposit funds into your account, you can only use a payment method accepted by us, which must be held in your name and registered to the address that you provided at registration. All deposits that you make with us shall be kept separate and distinct from our funds, and shall be managed and administered by us or third-party payment processors we have engaged. Funds held in your account do not accrue interest. 7.3. You must not make or attempt to make any chargebacks and/or deny or reverse any payment that you make to us. You will be required to reimburse us for any such chargeback, denial, or reversal, and any resulting loss we suffer. We also consider such activities to be fraudulent and illegal, and we reserve the right to report such activities to law enforcement authorities pursuant to Section 11.1 of these Terms. 8.1. Wagers may only be placed through your account. We do not accept wagers in any other form or by any other means. We reserve the right to refuse any wager, in whole or in part, in our sole discretion. We also reserve the right in our sole discretion to set maximum and minimum wager amounts and to update or change these amounts at any time. 8.2. We reserve the right to refuse or limit any wager(s) attempted to be placed by a player at our sole discretion and for any reason. In circumstances where a wager is deemed to be or is declared void by us, any sum deducted from your account in relation to that specific wager shall be re-credited to your account. Should we decide to waive any rule for the benefit of any player, it shall only be for that one instance and shall not set a precedent for the future. 8.3. Notwithstanding Section 8.8, we reserve the right to void any wager you place if the wager remains undecided or unresolved (e.g., in incomplete games) for whatever reason, including but not limited to server failure, server restart, loss of communication between player and server, or player’s computer failure, and is incapable of being resolved and completed through replay options or other means. If you notify us of an unresolved or undecided wager on your account, we may immediately (and without notice to you) void such wager if it cannot be resolved or completed. If you do not notify us of an unresolved or undecided wager on your account, we have the right to void such wager (without notice to you) after 90 days from the original wager placement date. 8.4. Wagers will only be validly made and accepted by us if they are accepted by our server located in the State of New Jersey, in accordance with the Act & Regulations, and made in accordance with both these Terms and the rules applicable to each individual game. Until our server actually accepts a valid wager made by you, all communications from you, and all information displayed through the Services, will be non-binding. 8.5. Rules for each of the wagering games on the Services, including pay tables, will be available to you through the Services at all times before and during game play. It is your responsibility to read and understand the rules of each game before you play, and you agree to abide by all such rules. All game rules are hereby incorporated by reference into these Terms. 8.6. We reserve the right, in our sole discretion, to make changes to the payout rates and pay tables applicable to the games available through the Services. The pay table for each slot game can be viewed by clicking on the Help / Pays (or similar language) button on the button panel for each slot game. The pay tables for the non-slot games (table, card, etc.) can be viewed by clicking on any button that reads “pay table” (or similar language); however, if no pay table button is viewable from the game, then by selecting a button or icon with the word “Help” on it. It is your responsibility to note the payout rate and pay tables applicable to each game in each session prior to placing a wager. 8.7. Random number generators tested and approved by the DGE and maintained by us and/or our third-party service providers will determine the outcome of all games available through the Services. In the event of a discrepancy between the results displayed on your computer and the game records on our server, our records shall be regarded as definitive. FOR ALL GAMES, MALFUNCTION VOIDS ALL PAYS AND PLAYS. A malfunction occurs whenever a hardware, software or other error interferes with the proper and normal game play, payout or result of a wager (i.e., a game attempts to pay out amounts that are incorrect or inconsistent with the rules of the games and the associated pay tables). 8.8.3. In the event our Geolocation Technologies verify your physical presence in the State of New Jersey when you initiate a game play session, but later during such session are unable to re-verify your continued physical presence in the State of New Jersey, the game in progress at the time of such failed re-verification will produce a final outcome, if possible, and the game play session will immediately and automatically terminate. 8.9. You agree not to interfere, interrupt, attempt to interrupt, or attempt to manipulate the operations of the Services or the normal play of any of the games in any manner whatsoever. In particular, you agree not to use or attempt to use any artificial intelligence or player assistance software, and instead, will always play personally via the interfaces provided only by us. 8.10. Upon your reasonable request, we will make available to you a copy of your account statement, detailing your account activity (including game play history). You hereby consent to the monitoring and recording by us, our third-party service providers, and the DGE of all wagering communications you make through the Services. 9.1. From time-to-time, we will offer Bonus Money opportunities, sweepstakes, contests, raffles, surveys, and other promotions (each a “Promotion”) through the Services. All Promotions will be governed by specific rules that are in addition to these Terms, and all such additional rules are hereby incorporated into these Terms. Always read the terms that apply to a Promotion prior to participating. By participating in any Promotion, you will become subject to those rules in addition to these Terms. At any time and without notice, we reserve the right to terminate, or change the terms of, any Promotion, and we shall not incur any liability for such a change or termination. 9.2. We offer “Bonus Money” through many Promotions, meaning restricted, non-withdrawable account funds. Bonus Money has no cash value, and cannot be transferred, exchanged, or withdrawn. All Bonus Money will have a “play-through requirement”, meaning that the player must meet minimum wagering requirements using the Bonus Money to convert it into unrestricted, withdrawable account funds (i.e. “cash”). The play-through requirements for certain Bonus Money may also require minimum contribution percentages from wagers on certain games or game types (for example: 20% of the play-through requirement must be met through wagers on slots). The play-through and other requirements and restrictions for Bonus Money will always be specified in the rules for each Bonus Money Promotion, but at a minimum, we will always require all Bonus Money to be wagered once before converting to cash. We reserve the right to change the play-through and other requirements and restrictions for Bonus Money at any time, whether or not the Bonus Money is already banked or activated in your Bonus Bank. 9.3. When we offer you Bonus Money, you can “activate” it to begin fulfilling its cash conversion requirements, or you can can “bank” it in your account (your “Bonus Bank”) in order to activate it at a later date. Bonus Money banked in your Bonus Bank can be activated at any time prior to its expiration (see Section 9.4), regardless of the order in which you originally banked it. Please note, however, that you must always activate all Bonus Money from a particular Bonus Money Promotion at once. 9.4. As a general rule, Bonus Money will expire 30 days after issuance, whether or not you have already activated it to begin fulfilling its cash conversion requirements. Notwithstanding the foregoing, at any time and for any reason, we reserve the right to amend or cancel any Bonus Money Promotion and/or cancel any Bonus Money prior to its conversion to cash. 9.5. Unless otherwise specified in its rules, each Bonus Money Promotion is limited to one per account. 9.6. In addition to the Bonus Money Promotions we offer generally to our player population, we may also choose, in our sole discretion, to provide additional Bonus Money Promotions, other Promotions, or comps to a particular player at any time and for any reason. When we offer such Promotions or comps to a player, we are under no obligation to issue the same or similar Promotions or comps to any other player. 10.1. You may make a withdrawal only from your own account. In order for you to make a withdrawal from your account, it must have a withdrawable cash balance (not solely Bonus Money). 10.2. When you wish to make a withdrawal from your account, we will make payment as soon as reasonably possible, subject to our standard internal processing time (which we estimate to be 3 business days). However, if at the time of a withdrawal request, you have any deposits which are pending receipt of confirmation of funds (e.g., deposits by check, ACH, wire transfer or other deposit methods), we reserve the right, in our sole discretion, to delay any withdrawal payment until such deposited funds have been confirmed. Additionally, you may experience additional delays due to any security or identity verification review we undertake, or whenever any other provision of these Terms allows or requires us to hold a payment. Prior to making payment on any withdrawal request, we reserve the right to verify your identity and/or conduct a security check via any method specified in Section 5 of these Terms. Should you fail to provide us with, or fail to verify the authenticity of, any information requested by us relating to your identity or any deposit or withdrawal method used by you, we reserve the right, in our sole discretion, to deny a withdrawal request. We are not responsible for any third-party financial clearing process that delays your withdrawal. 10.3. It is your responsibility to submit the correct details for withdrawal payments. We are not liable or responsible for reissuing any withdrawal payments made by us to an incorrect account as a result of incorrect account details provided by you or a third party payment vendor on your behalf. An incorrectly issued payment will only be credited to your corrected account details once we receive confirmation that the incorrectly issued payment has been successfully retrieved. 10.4. During any Cool-Off Period, in accordance with the Regulations, you will be able to withdraw the cash balance of your account. 10.5. Upon notice of your participation on the Self-Exclusion List, your account’s cash balance, less any Bonus Money and any winnings resulting from wagers of then-activated Bonus Money which has not yet converted to cash, will be mailed to you at the address of record we have on file for your account. 10.6. All taxes and fees payable on winnings resulting from wagers in your account, prizes awarded to you from Promotions, and Bonus Money converted to cash in your account, and/or any other payments we may make to you, and all associated tax filings, are your sole responsibility. No such winnings, prizes, cash, or payments can be transferred, substituted, or redeemed for any other consideration, except with our prior written consent. We reserve the right to make tax filings or other reports related to your use of the Services or any winnings, prizes, cash, or payments paid to you. 11.1.7. disclosure of your identity to any third party who is claiming that any of your User Content constitutes a violation of their intellectual property rights, right to privacy, or other legal rights. The actions described in this clause are not limited, and we may take any other action we reasonably deem appropriate. 11.2. A dormant account is an account where no real money wager has occurred by the player within the previous rolling 12 month period. Should an account become dormant, the funds in such account may become subject to forfeiture in accordance with the Act and Regulations. 11.3. We retain at all times absolute control over the issuing, maintenance, suspension and/or termination of all accounts, including dormant accounts. Our decision in any matter relating to any player‘s account and use of the Services is final. 11.4. Upon suspension or termination of an account, we will retain all records and information associated with such account for at least as long as necessary to comply with all requirements of the Act and Regulations. 11.5. You should be aware that if you breach any of the Terms, you may also be committing a legal offense, and you may be subject to legal action, including prosecution. We reserve the right to cooperate with law enforcement and other regulatory authorities, including the DGE and New Jersey Casino Control Commission, in investigating claims of suspicious or presumed illegal activity on the Services. 12.1. Where applicable through the public-facing features of the Services (e.g., on a message board, profile page, through refer-a-friend/share win features, via chat functionality, via email or other correspondence to us, by creation of a screen name, etc. ), you may be able to post your own content or information (“User Content”). You understand that all User Content, whether publicly posted on a forum, posted as part of your public profile or elsewhere, or transmitted to us for posting, is your sole responsibility. If you have any User Content that you would like to keep confidential and/or do not want others to use (including but not limited to, photos, personal information, etc. ), do not use such information as part of your screen name or profile page, post it or submit it for posting to public-facing portions of the Services. Under no circumstances will the Company be liable in any way for any User Content, including, but not limited to, any errors or omissions in any User Content, or for any loss or damage of any kind incurred as a result of the use of any User Content posted, emailed or otherwise transmitted via the Services. 12.2. By posting any User Content through the Services, you hereby grant the Company a royalty-free, fully paid up, perpetual, irrevocable, non-exclusive and fully sub-licensable right and license to use, reproduce, modify, adapt, publish, translate, combine with other works, create derivative works from, distribute, perform, edit and display such User Content (in whole or part) worldwide and/or to incorporate it in other works in any form, media, or technology now known or later developed. You specifically waive any “moral rights” in and to the User Content. You represent and warrant that you own the User Content posted by you on or through the Services or otherwise have the right to grant the license set forth herein, and the posting of your User Content on or through the Services does not violate the privacy rights, publicity rights, copyrights, contract rights or any other rights of any person. You agree to pay for all royalties, fees, and any other monies owing any person by reason of any User Content you posted to or through the Services. 12.3. You acknowledge and agree that the Company may preserve User Content and may also disclose User Content if required to do so by law or in the good faith belief that such preservation or disclosure is reasonably necessary to comply with legal process; enforce this Agreement; respond to claims that any User Content violates the rights of third-parties; or protect the rights, property, or personal safety of the Company, its users, or the public. 12.4.5. other advertising across all media. At all times we will use commercially reasonable efforts to ensure that your identity (other than your screen name) is kept confidential in such activities, unless we otherwise receive your permission. 13.1.17. cheat, collude, or engage in other fraudulent, illegal, or restricted activity in your play of games through the Services. 13.2. The Company assumes no responsibility for monitoring the Services for inappropriate submissions or conduct, but reserves the right to do so. If at any time the Company chooses, in its sole discretion, to monitor the Services, the Company nonetheless assumes no responsibility for the User Content, has no obligation to modify or remove any inappropriate User Content, and has no responsibility for the conduct of the users submitting any such User Content. Notwithstanding the foregoing, the Company and its designees shall have the right to remove any User Content at any time, without notice and for any reason, including but not limited to, User Content that violates this Agreement or is otherwise objectionable, as determined in the Company’s sole discretion. 13.3. If you suspect any player is cheating, colluding, or engaging in any other fraudulent activity in playing games through the Services, it should be reported to us immediately by email to [email protected] identifying the player or players’ screen names involved and including a brief description of their suspicious activities. 14.1. All the trademarks, service marks, trade names, copyrights, graphics, audio, songs, logos and other intellectual property used on or appearing through the Services belongs to us or our licensors. You acknowledge that by using the Services, including through the downloading of any software, you obtain no rights (and shall not claim any rights) in any content of the Services, any downloaded software, or any part thereof, other than the license to use the same as provided for in these Terms. Under no circumstances may you use any content of the Services without our prior written consent. You further agree to not use the Services in any unlawful manner, for any unlawful purpose, or in any way that is inconsistent with this Section or these Terms. 14.2. We grant you a personal, non-exclusive, non-transferable and non-assignable limited license to use the Services, including any software that you download (such as our mobile application) rather than access through a web browser, for their intended purposes, conditioned upon your continuing strict compliance with all of these Terms. Except for the license expressly granted hereunder, no rights, licenses, or permissions are granted or may arise in relation to the Services, whether expressly, by implication, estoppel, or otherwise. All rights, including all intellectual property rights, that are not expressly granted under this license are hereby reserved by us. 14.3. You represent, warrant, and covenant that you will not: (1) reverse engineer, disassemble, decompile, circumvent, translate, modify, obscure, or develop derivative works based on the Services or any of its subprograms, components, or modules; (2) merge any part of the Services into another program; (3) make any attempt to discover the source code of the Services; (4) place the Services onto a server so that it is accessible via a public network such as the Internet; (5) sublicense, rent, lease, or lend any portion of the Services or its associated documentation to any third party; and/or (6) remove or fail to reproduce any and all Company copyright or other notices that are included in the Services in the same form as they appear therein. 14.4. This license remains effective until termination of your account or upon notice by us for any reason. Upon termination of this license, you must cease all use of the Services and delete all copies of the associated software in your possession. 15.1.6. A statement by you, made under penalty of perjury, that the above information in your notice is accurate and that you are the copyright owner or authorized to act on the copyright owner’s behalf. 16.1. You expressly agree that as part of the Services you may receive communications by text message, push notification, and/or email, including promotional communications from time to time. You may stop receiving promotional alerts via email by clicking the unsubscribe link contained in such emails or by emailing your request to opt out. You may stop receiving push notifications by disabling push notifications on your mobile device. You may stop receiving promotional alerts via text message by responding “stop” to any promotional text received. You may also opt out of any of the above-specified communications through your My Account page. You may not opt out of transactional emails. 16.2. Company is not responsible for any surcharges you incur from your cell phone or internet service provider as a result of the use of the Services. 17.2. Notwithstanding any provision of these Terms to the contrary, by participating in a Promotion and accepting any prize, except where prohibited by law, each prize winner grants Company and its designees permission to use her/his name, screen name, photograph, likeness, voice, biographical information, statements, other User Content, and address (city and state only) for advertising and/or publicity purposes worldwide and in all forms of media now known or hereafter developed, in perpetuity, without further compensation. 18.1. YOUR USE OF THE SERVICES IS AT YOUR SOLE RISK. THE SERVICES ARE PROVIDED ON AN “AS IS” AND “AS AVAILABLE” BASIS. EXCEPT AS OTHERWISE EXPRESSLY PROVIDED IN THIS AGREEMENT AND TO THE FULLEST EXTENT PERMITTED BY APPLICABLE LAW, THE COMPANY AND ITS AFFILIATED ENTITIES, AND THEIR RESPECTIVE OWNERS, OFFICERS, DIRECTORS, MEMBERS, MANAGERS, EMPLOYEES, AND OTHER REPRESENTATIVES, AND THE COMPANY’S VENDORS AND BUSINESS PARTNERS (COLLECTIVELY, “THE COMPANY AND ITS AFFILIATED PARTIES”) EXPRESSLY DISCLAIM ALL WARRANTIES OF ANY KIND WITH RESPECT TO THE SERVICES, WHETHER EXPRESS OR IMPLIED, INCLUDING, BUT NOT LIMITED TO THE IMPLIED WARRANTIES OF MERCHANTABILITY, FITNESS FOR A PARTICULAR PURPOSE, AND NON-INFRINGEMENT. 18.2. THE COMPANY AND ITS AFFILIATED PARTIES SHALL NOT UNDER ANY CIRCUMSTANCES BE LIABLE FOR ANY DAMAGES OF ANY KIND ARISING OUT OF, IN CONNECTION WITH OR RELATING TO THE USE OF OR INABILITY TO USE THE SERVICES, INCLUDING ANY LIABILITY (I) AS A PUBLISHER OF INFORMATION; (II) FOR ANY MARKETING OF THE SERVICES; (III) FOR ANY DEFECTIVE FEATURE, FUNCTION, OR COMPONENT OF THE SERVICES; (IV) FOR ANY INCORRECT OR INACCURATE INFORMATION, (V) FOR ANY UNAUTHORIZED ACCESS TO OR DISCLOSURE OF YOUR TRANSMISSIONS OR DATA, (VI) FOR STATEMENTS OR CONDUCT OF ANY THIRD PARTY ON THE SERVICES, OR (VII) FOR ANY OTHER MATTER RELATING TO THE SERVICES. THIS IS A COMPREHENSIVE LIMITATION OF LIABILITY THAT APPLIES TO ALL DAMAGES OF ANY KIND, INCLUDING ANY DIRECT, INDIRECT, SPECIAL, INCIDENTAL OR CONSEQUENTIAL DAMAGES (INCLUDING DAMAGES FOR LOSS OF BUSINESS, LOSS OF PROFITS, LOSS OF GOOD WILL, LOSS OF USE, LOSS OF DATA, COST OF PROCURING SUBSTITUTE GOODS, SERVICES OR INFORMATION, LITIGATION OR THE LIKE), WHETHER BASED ON BREACH OF CONTRACT, BREACH OF WARRANTY, TORT (INCLUDING NEGLIGENCE), PRODUCT LIABILITY OR OTHERWISE, EVEN IF AN INDIVIDUAL ADVISES US OF THE POSSIBILITY OF SUCH DAMAGES. THE LIMITATIONS OF LIABILITY SET FORTH HEREIN ARE FUNDAMENTAL ELEMENTS OF THE BASIS OF THE BARGAIN BETWEEN THE COMPANY AND YOU. THE SERVICES WOULD NOT BE PROVIDED WITHOUT SUCH LIMITATIONS. NOTWITHSTANDING THE FOREGOING, THE SOLE AND ENTIRE MAXIMUM LIABILITY OF THE COMPANY AND ITS AFFILIATED PARTIES FOR ANY REASON, AND YOUR SOLE AND EXCLUSIVE REMEDY FOR ANY CAUSE OF ACTION OR CLAIM WHATSOEVER, SHALL BE LIMITED TO THE AMOUNT OF ANY DEPOSITS AND WINNINGS RESULTING FROM WAGERS ON YOUR ACCOUNT (TO THE EXTENT YOU OTHERWISE REMAIN ENTITLED TO SUCH DEPOSITS AND WINNINGS UNDER THESE TERMS) REMAINING IN YOUR ACCOUNT AT THE TIME OF YOUR CAUSE OF ACTION OR CLAIM. YOU ACKNOWLEDGE AND AGREE THAT IF YOU DO NOT HAVE ANY SUCH DEPOSITS OR WINNINGS IN YOUR ACCOUNT AT THE TIME OF SUCH CAUSE OF ACTION OR CLAIM, YOUR SOLE AND EXCLUSIVE REMEDY FOR ANY DISPUTE WITH THE COMPANY IS TO STOP USING THE SERVICES AND CANCEL YOUR ACCOUNT. 18.3. SOME JURISDICTIONS DO NOT ALLOW THE DISCLAIMER OF CERTAIN WARRANTIES OR THE LIMITATION OR EXCLUSION OF LIABILITY FOR CERTAIN TYPES OF DAMAGES. ACCORDINGLY, SOME OF THE ABOVE DISCLAIMERS AND LIMITATIONS MAY NOT APPLY TO YOU. IN SUCH JURISDICTIONS, THE EXCLUSIONS AND LIABILITY ARE LIMITED TO THE FULLEST EXTENT PERMITTED BY APPLICABLE LAW. 18.4. MALFUNCTIONS VOID ALL PAYS AND PLAYS. IN THE EVENT OF ANY ERRORS, MALFUNCTIONS, VIRUSES OR BUGS, COMMUNICATIONS FAILURE, OR SYSTEMS FAILURE RELATING TO THE SERVICES, AND RESULTING IN LOSS, CORRUPTION, OR MISCALUCATION OF DATA OR WINNINGS OR BONUS MONEY AMOUNTS, THE COMPANY AND ITS AFFILIATED PARTIES SHALL NOT IN ANY WAY BE LIABLE TO YOU, AND THE COMPANY SHALL VOID ALL GAMES IN QUESTION AND PAYMENTS IN RELATION THERETO, AND MAY TAKE ANY OTHER ACTION DEEMED NECESSARY BY COMPANY IN ITS SOLE DISCRETION TO CORRECT SUCH ERRORS. THE COMPANY IS NOT REQUIRED TO PROVIDE ANY BACK-UP NETWORK AND/OR SYSTEMS OR SIMILAR SERVICES. IF ANY SUCH ERROR OR MISCALCULATION RESULTS IN OVERPAYMENT TO YOU OF WINNINGS RESULTING FROM WAGERS ON YOUR ACCOUNT, YOU SHALL NOT BE ENTITLED TO RECEIVE OR RETAIN SUCH WINNINGS, SHALL IMMEDIATELY INFORM US OF THE ERROR, AND SHALL REPAY ANY SUCH WINNINGS TO US (OR THE COMPANY MAY, IN ITS SOLE DISCRETION, DEDUCT AN AMOUNT EQUAL TO SUCH WINNINGS FROM YOUR ACCOUNT, SET OFF SUCH AMOUNT AGAINST ANY OTHER WINNINGS OWED TO YOU, OR TAKE ANY OTHER ACTION NECESSARY TO COLLECT SUCH WINNINGS AS PERMITTED BY THE ACT, REGULATIONS, AND OTHER APPLICABLE LAWS). 18.5. THE COMPANY AND ITS AFFILIATED PARTIES SHALL NOT BE LIABLE FOR ANY ACTS OR OMISSIONS MADE BY YOUR INTERNET SERVICE PROVIDER, TELECOMMUNICATIONS PROVIDER, OR OTHER THIRD-PARTY YOU HAVE ENGAGED TO GAIN ACCESS TO THE SERVICES. • your obligations with respect to overpayment of winnings as specified in Section 18.4. 20.1. You may contact us at any time using the details set out below should you have questions or need assistance. To provide a better service and for your protection, telephone conversations, chats, and emails may be recorded and/or monitored by designated staff. 20.2. Any complaints should also be directed to our Player Support services team. If you have any complaint or issue relating to the Service, you should in the first instance contact our Player Support services team as set out below. If you are not satisfied with the way that your complaint was handled by our Player Support services team, our management may intervene to resolve any outstanding grievance. You agree to follow and exhaust any grievance/ dispute resolution policy we may put in place from time-to-time. After all reasonable steps have been taken by you and us to resolve your complaint, you may file a complaint with the DGE by emailing [email protected] or calling (609) 984-0909, or by submitting the Internet Dispute Form on the DGE’s website: (http://www.nj.gov/oag/ge/inquiriespatroncomplaints.html). 20.3. We reserve the right to provide a copy of your complaint and relevant documentation to the DGE. 22.3. The failure of the Company to insist upon strict adherence to any term of this Agreement shall not constitute a waiver of such term or limit Company’s right thereafter to insist upon strict adherence to that term or any other term of this Agreement. 22.4. If any provision of these Terms and Conditions shall be determined to be unlawful, void, or for any reason unenforceable, then the unlawful, void, and/or unenforceable provision(s) shall be deemed severable from the other provisions contained herein and shall not affect the validity and enforceability of any of the remaining provisions. The Services are not directed to, and we do not knowingly collect information from, anyone under 21 years of age. If we determine that a user is under this age, we will not use, maintain, or continue to collect information from such user. We will collect the information you directly provide to us in the course of using the Services, such as when you apply for an account through the Services; complete a Contact Us form; participate in contests, promotions or surveys; or otherwise communicate with us. When you apply for an account through the Services, we will ask you to provide your personal information including, as we may require in our sole discretion, your name, e-mail address, physical address, date of birth, gender, driver’s license (or other government-issued ID) information, social security number, and/or financial account/deposit and withdrawal method details. We may also give you the option to provide your Rush Rewards and SugarHouse® Casino4Fun™ (or similar loyalty program) account number, if any, to accelerate your registration to the Services. When you wish to fund your account to participate in wagering games offered through the Services, we will also ask you for financial account/deposit and withdrawal method details. At any time during the registration process or thereafter, we may also ask you to provide supporting documents including, but not limited to, (a) a copy of your driver’s license (or other government-issued ID), (b) proof of your address such as a utility bill or bank statement, and (c) proof of your financial account/deposit and withdrawal method. In our sole discretion, we may ask that you provide notarized copies of these documents as an additional layer of verification. You hereby expressly consent to our verification (including through third-party verification services) of all information you provide during the account registration process or thereafter during your use of the Services. Location Information: We, our third-party service providers, and the DGE will utilize tracking technologies to verify and record your physical location when you are participating or attempting to participate in wagering games through the Services ("Geolocation Technologies"). These Geolocation Technologies will report the physical location of the device you are using to access the wagering games through our Services to us. By registering for an account through the Services and/or by using the Services, you consent to these uses of Geolocation Technologies, and to storage of records confirming your location within the State of New Jersey for up to ten (10) years as required by the Act and Regulations. For more information, please see “Your Choices” below. Information Collected by Cookies and Other Tracking Technologies: We may use various technologies to collect information via our Services, and this may include sending cookies to your computer or mobile device. Cookies are small data files stored on your hard drive or in device memory that help us to improve our Services and your experience, see which areas and features of our Services are popular and count visits. We may also collect information using web beacons (also known as “gifs,” “pixel tags” and “tracking pixels”) and Flash Cookies (text files sent by a web server when your browser requests Adobe Flash-supported content). Web beacons are electronic images that may be used in our Services or emails and help deliver cookies, count visits, understand usage and campaign effectiveness and determine whether an email has been opened and acted upon. Flash Cookies are text files sent by web servers when your browser requests Adobe Flash-supported content, and are used for similar purposes as traditional cookies. For more information about cookies, web beacons, and Flash Cookies, and how to disable them, please see “Your Choices” below. We may receive information about you from other sources and combine or link that information with information we have about you. For example, we (directly or through our third-party service providers) may perform background checks on you in order to verify your identity, history, or any other information you have provided to us. These background checks may vary on a case-to-case basis, but could include credit checks and/or general background investigations. You hereby expressly consent to such background checks, and acknowledge that we are not obligated to advise you when we perform a background check or the nature of any particular investigation. Link or combine with other information we get from other companies to help understand your needs and provide you with better service. RSI is based in the United States and the information we collect is governed by U.S. law. By accessing or using the Services or otherwise providing information to us, you consent to the processing and transfer of information in and to the U.S. If you use the message boards, chat rooms, comment tools, or other public forums of the Services, you will be publicly identified by your screen name you use and other User Content (as defined in our Terms of Service) you submit. Additionally, when you participate in certain promotions offered through the Services (e.g., the Leaderboard Promotion), we may also identify you by your screen name. Your screen name and all information you provide on these public forums will be viewable by the general public. We cannot be responsible for any personal or sensitive information in your screen name or which you choose to post on public forums and we recommend careful consideration before you include any personal or sensitive information in your screen name or otherwise post such information. You agree that you will not disclose personal or sensitive information relating to any other person in a public forum of the Services without that person’s prior, express consent. We take reasonable measures to help protect information about you from loss, theft, misuse and unauthorized access, disclosure, alteration and destruction. We use technology that is designed for use with secure web servers. Secure Sockets Layer ("SSL") technology encrypts your personal information as it is transmitted over the Internet during the account registration process and during any subsequent verification requests we may make. You may opt out of receiving promotional emails or text messages from RSI by following the instructions in those emails or text messages, or through your My Account page. If you opt out, we may still send you transactional or relationship messages, such as emails or text messages about our ongoing business relations. With your consent, we may send push notifications to your mobile device to provide game-related information, service updates, promotional communications and other related messages. You can deactivate these notifications by changing the notification settings applied to our mobile application on your device, or you can opt out of receiving these notifications through your My Account page. It is a Federal offense and a violation of New Jersey state law (N.J.S.A. 5:12-95.23a) for persons physically located outside of the State of New Jersey to engage in internet wagering through a casino in the State of New Jersey. In order to participate in wagering games offered through the Services (but not otherwise access or use your account), you must be physically located in the State of New Jersey. If you disable or attempt to disable our use of Geolocation Technologies at any time, you may not participate in wagering games available through the Services, but may continue to access or otherwise use the Services. You may choose to disable certain Geolocation Technologies through the location settings applied to our mobile application on your device. You may also disable certain Geolocation Technologies by deleting our mobile application from your device or otherwise ceasing use of the Services. These Player Protection Terms are part of our Terms of Service. Capitalized terms used in these Player Protection Terms and not defined herein have the meanings given to them in the Terms of Service. You can obtain a copy of these Player Protection Terms and our Terms of Service at any time by emailing our Player Support services team at [email protected]. 1.1. We are committed to make responsible gaming a priority and take this issue very seriously. While many are able to gamble responsibly, there is a small portion of the population who can develop a serious, sometimes uncontrollable gambling problems. This can affect persons of any age, income, gender or race at any time. To protect those that are vulnerable to gambling problems and others affected by their behavior, we have established policies and guidelines which deal with issues such as underage gambling and problem gambling as detailed on this page. We have additionally implemented employee education and training programs, and detailed written procedures, to help our employees identify and assist in managing these issues. 1.2.1. Gambling is never a solution to any problem. Gambling should always be for entertainment purposes only. 1.2.2. You can never rely on or expect gambling winnings for any reason. Never gamble with more money than you can afford to lose. 1.2.3. Never use gambling as a coping mechanism. If you are suffering from anxiety, depression, anger, sadness, any heightened emotional state, or any professional or personal problems, do not gamble. 1.2.4. Always set time and money limits before you start to gamble, and adhere to those limits. Never believe that increasing your bets or gambling longer will improve your odds of winning or recovering gambling losses. 1.2.5. Never give in to pressure to gamble by friends, colleagues, family, or others. If you do not feel comfortable gambling in general or in a particular situation, do not participate. 1.2.6. If you know that you have an addictive personality or suffer from any other addictions (drugs, alcohol, etc. ), do not gamble. 1.3. You may set responsible gaming limits for the Services, including deposit limits, spending limits, and time limits, and/or self-suspend your participation in wagering games offered through the Services for a designated time period of at least 72 hours (a “Cool-Off Period”) as detailed at: https://www.playsugarhouse.com/?page=my-account&subpage=responsible-gaming#resplimit-cooldown. 1.4. You also have the right to participate in the New Jersey Casino Self-Exclusion Program and be placed on a self-exclusion list maintained by the DGE (“Self-Exclusion List”). By opting to place yourself on the Self-Exclusion List (for, as you elect, 1 year or 5 years), you are prohibited from using the Services and otherwise engaging in internet gambling anywhere else in the State of New Jersey. We will also not be allowed to send you any marketing communications with respect to the Services while you remain on the Self-Exclusion List. You will not be permitted to engage in internet gambling in the State of New Jersey until after your specific exclusion period ends and you have requested removal from the Self-Exclusion List by visiting any office of the DGE during business hours. Self-Exclusion List elections are irreversible and cannot be ended early. Additional information on the Self-Exclusion List is available at: http://www.nj.gov/oag/ge/selfexclusion.html. 1.5. If you or someone you know has a gambling problem, and wants help, call: (a) the Council on Compulsive Gambling of New Jersey at 1-800-Gambler (see also: www.800gambler.org); or (b) Gamblers Anonymous at 855-2-Call GA (see also: www.gamblersanonymous.org). 2.1. In the event that you forget your account password, or that your password becomes, or you suspect that it may become, known to any unauthorized person, you will immediately notify us of such event. You may reset your password at any time by clicking on any “lost password” link available through the Services, after which, we will send a password reset link to your email address on file. By clicking on that password reset link, and by correctly answering two security questions we have on file for you, you will be able to select a new password. We will confirm each successful password reset via email to your email address on file. 2.2. After three consecutive incorrect account login attempts, your account will require secondary authentication (via password and a PIN we will send to your email address on file) for login. After ten consecutive incorrect login attempts, our system will lock your account and make it inaccessible for 15 minutes, whether or not the correct password is provided during such period. However, you may bypass the lockdown period by resetting your password as specified in Section 2.1. 2.3. You can elect, at your option, for “strong authentication” of your account during the account registration process. With strong authentication, each time you wish to log in to your account, you will receive an email message from us containing a temporary PIN number. You must then enter that PIN during account login in order to access your account. 3.1. You may contact us at any time using the details set out below should you have questions or need assistance. To provide a better service and for your protection, telephone conversations, chats, and emails may be recorded and/or monitored by designated staff. 3.2. Any complaints should also be directed to our Player Support services team. If you have any complaint or issue relating to the Service, you should in the first instance contact our Player Support services team as set out below. If you are not satisfied with the way that your complaint was handled by our Player Support services team, our management may intervene to resolve any outstanding grievance. You agree to follow and exhaust any grievance/ dispute resolution policy we may put in place from time-to-time. After all reasonable steps have been taken by you and us to resolve your complaint, you may file a complaint with the DGE by emailing [email protected] or calling (609) 984-0909, or by submitting the Internet Dispute Form on the DGE’s website: (http://www.nj.gov/oag/ge/inquiriespatroncomplaints.html). 3.3. We reserve the right to provide a copy of your complaint and relevant documentation to the DGE. Upon your reasonable request, we will make available to you a copy of your account statement, detailing your account activity (including game play history). 5.1. It is a criminal offense for anyone under the age of twenty-one (21) (the “Legal Age”) to participate in wagering games online (or for anyone to facilitate participation in wagering games online by anyone under the Legal Age). No one under the Legal Age is permitted to use the Services. We reserve the right to request proof of age or re-confirm such information from you at any time. We may terminate your account and prohibit you from using the Services if proof of age is not provided or if we suspect that you are not at least the Legal Age. 5.2. You may never access or use the Services through another person’s account or permit any other person to access or use the Services using your account. Never leave your account open and unattended. If you must step away from the device on which your account is open, lock the device to prevent unauthorized access. There are Federal prohibitions and restrictions regarding Internet gaming, specifically, the limitations upon Internet gaming set forth in 18 U.S.C. §§ 1084 et seq. (The Wire Act) and 31 U.S.C. §§ 3163 through 3167 (UIEGA). It is a Federal offense and a violation of New Jersey state law (N.J.S.A. 5:12-95.23a) for persons physically located outside of the State of New Jersey to engage in internet wagering through a casino in the State of New Jersey. In order to participate in wagering games offered through the Services (but not otherwise access or use your account), you must be physically located in the State of New Jersey. You agree that you will not attempt to participate in such wagering activities while physically located outside of the State of New Jersey, and acknowledge that any such attempt could result in enforcement actions against you. If you or someone you know has a gambling problem, and wants help, call: (a) the Council on Compulsive Gambling of New Jersey at 1-800-Gambler (see also: www.800gambler.org); or (b) Gamblers Anonymous at 855-2-Call GA (see also: www.gamblersanonymous.org).